Production has been under way for the past month on Fast and Furious 8, with the sequel already shooting in both Cuba and Iceland. The crew recently started a new tradition called #FastFridays, where they share a video from the set every week. But director F. Gary Gray has now started sharing even more videos and photos throughout the entire week. It seems production has shifted back to the U.S., with teh filmmaker now teasing that they wanted to capture some extra shots in the U.S.
Over the past few hours, F. Gary Gray has shared five different videos and photos through Instagram, one of which gives us a look at Kristofer Hivju, who was first seen in the cast photo that debuted earlier today. While we don't get to see the actor in action, we do see his intense look as he watches footage that was shot earlier in the day. F. Gary Gray also revealed in another video that the sequel is using the biggest blue screen environment in franchise history. Here's what the filmmaker had to say below. "The biggest blue screen environment in @fastandfuriousmovie history! We shot for weeks in #Iceland, but I wanted to shoot a few details here in the #usa. #hardatwork! 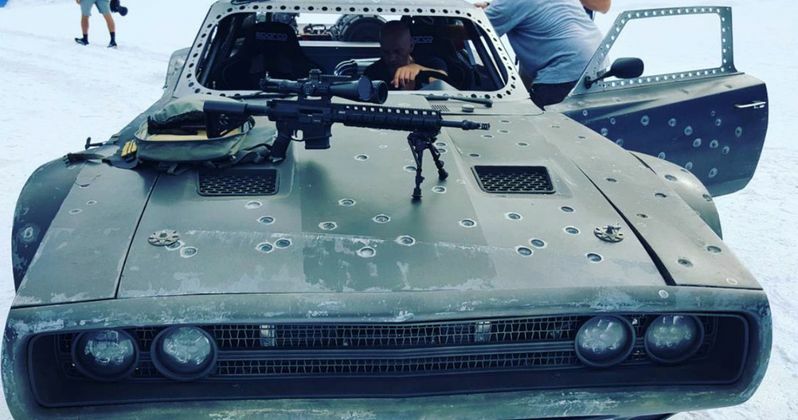 #F8 #behindthescenes"
That video also gives us a glimpse at a souped-up Dodge Charger which has been riddled with bullet holes. One of the other videos showcases the testing of some "bad guy toys," with an unidentified crew member seen firing rounds from one of the machine guns on this blue-screen set. Unfortunately, the director wouldn't shed any light on where these scenes take place within the movie, or why that Dodge Charger was shot up so much. These videos come just a few days after a sneak peek from the Cleveland set revealed an explosive stunt. That footage showcased a number of cars being dropped out of a parking garage, but it isn't clear if any principal cast members were on hand for that stunt. With production just getting started, we'll have to wait and see how much footage F. Gary Gray and the rest of the cast end up sharing through social media. F. Gary Gray is directing Fast 8 from a script by Chris Morgan, who has written every movie in the franchise except for the first two. Aside from Kristofer Hivju, new cast members include Charlize Theron as the main villain, and Scott Eastwood as a protege to Kurt Russell's Mr. Nobody. Vin Diesel, Dwayne Johnson, Michelle Rodriguez, Tyrese Gibson, Kurt Russell, Nathalie Emmanuel, Jason Statham and Ludacris are all set to reprise their roles from this lucrative franchise. Take a look at the new set videos and photos below, and stay tuned for more as Fast & Furious 8 continues production. Can The Circle Stop Fate of the Furious at the Box Office?